Pyrus calleryana, the Callery pear known in the USA as the Bradford Pear, is a species of pear native to China and Vietnam, in the family Rosaceae. It is a deciduous tree growing to 5 to 8 m tall, often with a conic to rounded crown. The leaves are oval, 4 to 8 cm long, glossy dark green above, and slightly paler below. The white, five-petaled flowers are about 2 to 2.5 cm in diameter. They are produced abundantly in early spring, before the leaves expand fully. The fruits of the Callery pear are small (less than one cm in diameter), and hard, almost woody, until softened by frost, after which they are readily taken by birds, which disperse the seeds in their droppings. In summer, the foliage is dark green and very smooth, and in autumn the leaves commonly turn brilliant colours, ranging from yellow and orange to more commonly red, pink, purple, and bronze. 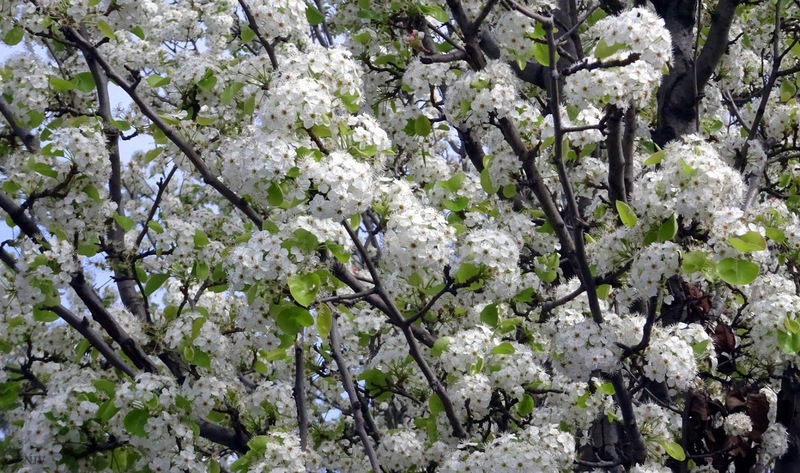 Callery pears are remarkably resistant to disease or blight though they are regularly killed by strong winds, ice storms, heavy snow, or limb loss due to their naturally excessive growth rates. Some cultivars, such as 'Bradford', are particularly susceptible to storm damage. The species is named after the Italian-French sinologue Joseph-Marie Callery (1810–1862) who sent specimens of the tree to Europe from China. The initial symmetry of several cultivars led to their attempted use in settings such as industrial parks, streets, shopping centres, and office parks. As such they proved so successful that they are deemed an invasive species, outcompeting many native plants and trees. Their dense clusters of white blossoms are conspicuous and very pretty in early spring, however their smell is commonly found unpleasant by many people (me included!). The smell is often described as 'fishy' and 'putrid'.